Just browsing the sales corner of the friendly place to discuss watches (without oppressive moderation) called TZ-UK, I noticed this lot of (vintage) Omega Speedmaster (pre-)Professional watches. The most interesting item is this Speedmaster CK2998-62 with caliber 321 and with a ref.7912 bracelet, the second generation of Speedmaster watches. Then there are two more common vintage references, the famous 145.012-67 Speedmaster Professional with caliber 321 movement. Both come with the correct bracelet for that period, the ref.1039 with stretch links. Then there is the first reference with a caliber 861 movement, also Lemania based but without the columnwheel (and ticks at 21600bph instead of 18000bph). It’s the reference 145.022-69 Speedmaster Professional. This watch comes – just as the others – with matching box and booklet, but with a strange bracelet. It is an Omega signed bracelet made in Mexico (which is correct) in 1968. Cool thing about this watch is that it has the horizontal ‘First Watch Worn On The Moon’-inscription. Word goes that only 300 of these ‘horizontal inscription’ ref.145.022 models have been made, however, this has never been confirmed. Actually, the seller has another one for sale with this inscription, but this time with a ref.1039 stretch bracelet. Although Omega already had the ref.1171 bracelet by then, it is quite common to see Omega watches with different parts from those years. It seems that this could be perfectly original, as Omega mixed up the references quite often. I guess this had something to do with finishing up supplies…. As the next watch for sale is a perfect example of this as well, a ref.145.022-68 with a caliber 321 dial. This means that it does have the caliber 861 (introduced in October 1968), but with the metal applied Omega logo on the dial as seen on the models pre-October 1968 with caliber 321 movement. Next up are three more modern Speedmaster watches. 2x a Professional with a display back (1983 and a more recent model). I doubt that the red box that comes with the 1983 model is valid, as Omega was not using these boxes until the 1990s. It should have been a grey leather box imho. 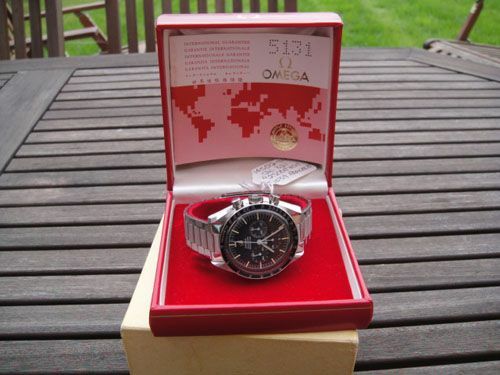 Anyway, it is a nice gesture to make sure the watches come complete with box and booklets. 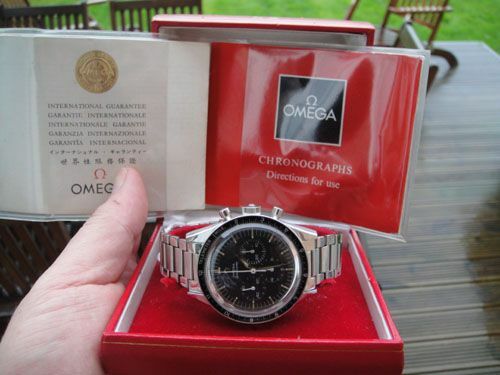 Last modern Speedmaster for sale is the Schumacher edition. A non-Professional model with so-called ‘Paul Newman’ dial and with a modern bracelet. Prices start at 1,900 GBP. The vintage pre-Pro ref. CK2998-62 is the most expensive of the lot, with 5,500 GBP. You can see the entire lot with photos of all watches by clicking here.